This black skull keychain hits hard in defensive situations while being a handy key holder. 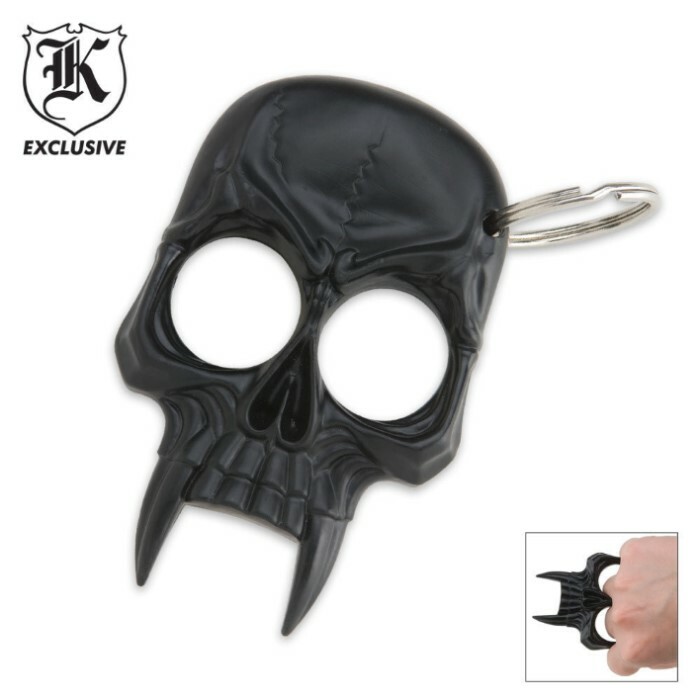 The eye sockets become finger holes and the fangs become spikes when clutched in the hand to create an excellent means of self-defense against an attacker. The black finished hard-plastic charm includes a silver ring for attaching keys. This keychain looks non-threatening enough, is easy to carry, and can provide peace of mind. have seen these, bough 15 of them chrismas, only 301 days away! This thing is very sturdy. It is pretty large though for it to really be on ones key chain but still a great product. I used it on a really hard satyr foam shooting block and just with 3-5 swipes with the beauty it did a lot of serious damage. this weapon is great my wife keeps it on her keychain and no one is the wiser that it is a self defence weapon. it strong and durable she even had to use it once. long story short she hit a guy in the arm and then the face it poked through his arm. and on his face, well he cant see out of his left eye ever again. of course it was used in self defence. thank you so much true swords. Really cool, way better than I expected. Friends all want one, thanks budk. This thing is off the chain!! Pun intended! The skull is bigger and thicker than I thought it would be. Very strong and worth every penny. I am going to buy several more of these myself. Looks great on my key chain, fits great in my hand, and is flat enough to fit in my pocket with my keys. Glad I got it. 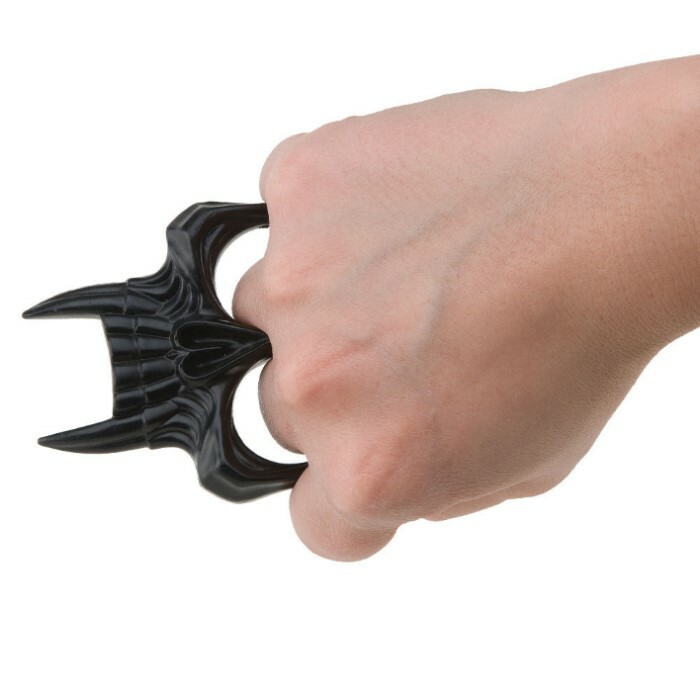 Definitely something to carry for self-defense. Will make the bad guys think twice. Trust me no one wants to get hit with this a second time. Lightweight easy to conceal a must for loved ones, keep them safe. This key chain is strong and menacing. If I saw someone with this, I would give that person some space. It is pretty big, I wouldn't keep keys on it. I keep it in my back pocket behind my wallet and it feels perfect back there, not bulky or taking up space. It's so inexpensive, I just might have to buy a couple more. I got this for my gal to keep on her keyring. I almost stole it. Its super hard plastic, much harder than anyone's flesh that you might would ever have to hit with it. It is a bit bulky to have in your front pocket, but so far most people that see it just think its a knick-knack for her keyring. To and from the car, its in her hand, and it doesn't LOOK like she's brandishing a weapon. Since no one freaks when they see it, and its so lightweight, I'm going to start carrying one in my cargo pockets. I'm ordering another one... right... now.